Invisalign computer-generated orthodontic treatment plans—Invisalign® is a system of moving teeth in small increments with clear plastic aligners. The Invisalign treatment plan plots the step-by-step movement of the teeth in a series of computer-generated images. This plan enables us to show you visually what the proposed orthodontic treatment should accomplish. 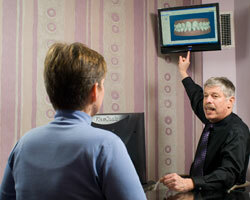 With conventional orthodontics, you cannot see what the final result will be.